My sister-in-law is getting married soon, and she had a pre-wedding party where she invited a bunch of people for a cookout. At the park where the barbecue was held, there was a playground. I told Namine that she could go up there, but she had to stay in her wheelchair. That contented her for a while, but it didn’t seem fair to her that she was the only one not allowed to actually climb up on the playground. Namine came back down the hill to talk to me. 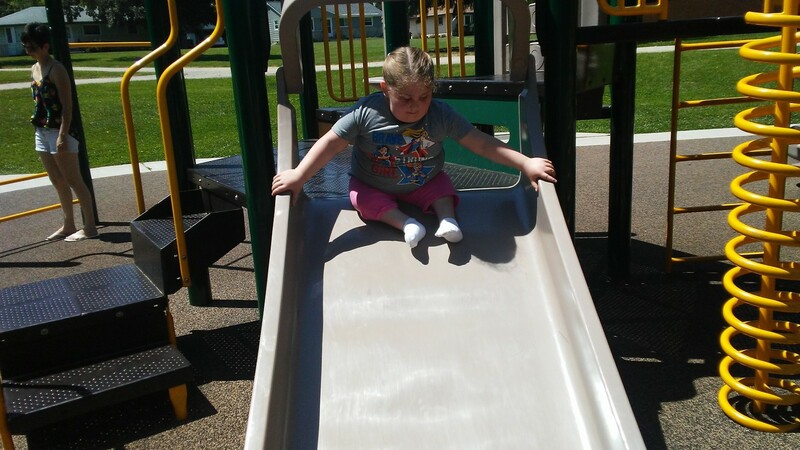 She didn’t complain about unfairness; she simply stated that she wanted to get out of her wheelchair so she could climb up and play with the other children. I told her yes, on one condition. I didn’t want her going down the slide by herself. It was a condition Namine agreed with heartily, since she’s not likely to forget breaking her leg anytime soon. I’ll admit that even though I gave her permission to play and climb by herself, and even though I knew where she was, the helicopter parent in me wanted to run up that hill and sit on the playground bench and watch her every move. I wanted to be there, right there, in case she needed me. What if she fell? What if she broke her leg again, and I might have prevented it? I have to remind myself that I can’t hover all the time. I have to let her go and be a child. She needs some freedom; she’s eight years old, almost nine, an honest and trustworthy child. I believe her when she promises me something, and she deserved to be allowed the freedom of play without a hovering parent. I did keep an eye on Namine from the picnic tables, and she did start to make me nervous. I saw her sitting at the top of the slide, playing catch with a girl at the bottom. The way she leaned out over the slide made my heart jump into my throat, so I went back up with the intention of talking to Namine about not giving her daddy a heart attack.